The CHP Level 2 Option on Capital Raising (formerly Marketing & Sales)combines hedge fund marketing and sales training with sales best practices to create a platform where third party marketers, capital introduction professionals, investor relations, and in-house marketers can gain credibility and certify their knowledge within this space. Level 2 builds on CHP Level 1 by referring to investment strategies, terms, and trends discussed within the Level 1 reading materials. The required readings and resources for the CHP Level 2 program are described in the study guides below. CHP Level 2 in Capital Raising Certificate: Within a few weeks after you receive a passing grade for CHP Level 2 in Capital Raising, your certificate will be emailed to you after specifying exactly how you would like your name denoted on the certificate. 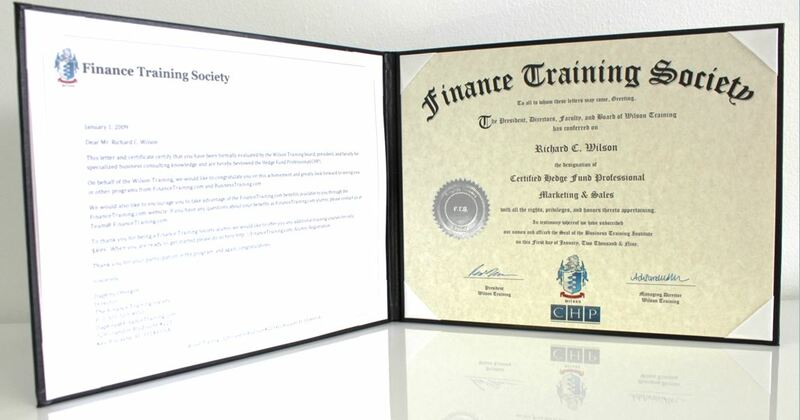 You may also order a hard copy diploma in a padded leatherette holder for a nominal fee. The materials used to train participants include three books and exclusive video content. The video content includes lectures on hedge fund marketing and sales best practices, as well as short hedge fund marketing tips and techniques. The video content within this portion of the program is worth far more than the CHP tuition since this material can normally only be received by retaining $200+/hour consultants or attending expensive industry conferences charging over $1,000 for admission. All of these resources have been put together by professionals who have raised capital for hedge funds in the past, and each is made to be as practical and actionable as possible. If you have any questions about this program, please contact our team or click the “Click to Chat” button to the right. To watch videos and read quotes from past participants, click here. © 2007-2018 by Hedge Fund Group (HFG) Association. All Rights Reserved.